Mr. Newberger holds a B.S. in Music Education from Towson University, where he was awarded a full tuition scholarship and he was the concertmaster of the university orchestra. 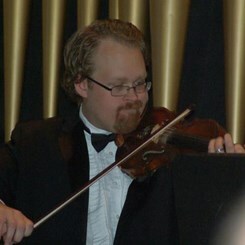 He has over twenty years of private teaching experience on violin and viola, from beginner to advanced and has taught orchestra for seven years in the public schools of MD and WV. He was the assistant director of the York Junior Symphony for ten years and was also the sectional coach for violins at Shippensburg and Shepherd Universities. Mr. Newberger has over twenty years of performance experience as a violinist, including the York Symphony, Salisbury Symphony Orchestra, the Pennsylvania Philharmonic, Shippensburg Festival Orchestra, Two Rivers Chamber Orchestra, and other orchestras in MD, PA, and WV. He has had the fortunate experience playing in orchestras alongside premier violin soloists including Joshua Bell, Sarah Chang, Eugene Fodor and Nadja Solerno-Sonnenberg, and even 'pop' artists including Clay Aiken, Peter Cetera and Natalie Cole.